This live recording of "Der Messias" is part of a cycle of oratorios and masses, performed in the basilica of Maulbronn Abbey under the direction of Jürgen Budday. 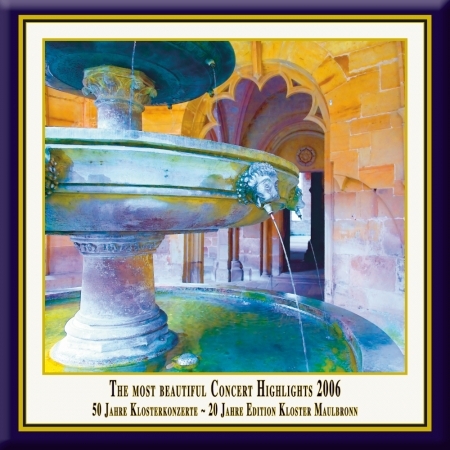 The series combines authentically performed oratorios and masses with the optimal acoustics and atmosphere of this unique monastic church. This ideal location demands the transparency of playing and the interpretive unveiling of the rhetoric intimations of the composition, which is especially aided by the historically informed performance. The music is exclusively performed on reconstructed historical instruments, which are tuned to the pitch customary in the composer's lifetimes (this performance is tuned in a' = 430 Hz). The bassoon is often considered the clown of the orchestra but in his Sonata for Bassoon and Piano Saint-Saëns explores the elegant and dignified nature of the instrument. He began composing at the age of three and completed approximately three hundred works. Other French composers such as Poulenc and Ravel were said to have been inspired by Saint-Saëns, and Poulenc is even alleged to have borrowed musical ideas from him! The woodwind sonatas belong to his later works and were each dedicated to highly regarded players of the era. The Sonata for Bassoon is dedicated to his friend, Leon Letellier, and who was also the principal bassoonist of the Paris Opera orchestra. The piece begins in the high tenor register and emerges from, what seems like nothing - as if the melody had been hanging in the air just waiting to be heard before unfolding to become an elated melody. The second movement is a virtuosic scherzo which exemplifies the typically humorous character of the bassoon. The third movement begins once again with a floating melody that evolves into an impassioned middle section characterized by rhythmic passagework before the reprise disperses the tension eventually ending on an imperfect cadence which leads directly into the juxtaposed circus like finale. In 1920 Francis Poulenc was counted amongst the "Groupe des Six" which included the composers Darius Milhaud, Arthur Honegger, Louis Durey, Jean Cocteau, Germaine Tailleferre and Georges Auric. Technically speaking this was not a Society but rather the creation of a music journalist who simply used these representatives of Modernism as an analogy to "The Mighty Handful", the group of five Russian Composers including Mussorgsky and Balakirev in the second part of the 19th Century. The Trio was composed in 1926 and is dedicated to the Spanish composer Manuel de Falla. It is written in the typical quick - slow - quick form and is considered to be amongst Poulenc's finest works. It is also the first instance of Poulenc giving a more dominant role to the piano within his chamber music writing. The choral concert "Human being lives and consists · Birth ~ Finiteness ~ Eternity"
In this collection entitled "Der Mensch lebt und bestehet" (Human being lives and consists), the Maulbronn Chamber Choir presents compositions that are interconnected in themselves and in content, in that they regard birth as more than just a joyful event. It is an act of creation, in which the divine and the human find each other and which implies earthly finiteness, but at the same time transcends this and leads back to its divine beginnings. This is how the prophetic words of the Old Testament are taken up, words that are substantiated in the annunciation to Mary of the incarnation of Christ ("Angelus Domini - Ave Maria") and that lead into the events of Christmas ("Gloria" and "O magnum mysterium"). Yet at the same time, their central theme is the union of man with divine reality by means of reformation and contemplation (the "unio mystica"). Each life has a goal that transcends earthly finiteness, leading to what Reger calls that "hellen, schönen, lichten Tag, an dem er/sie selig werden mag" (that bright, beautiful, clear day when he or she blessed be). "A Hymn to the Virgin" by Benjamin Britten (1913-1976), a composition for two choirs, is presented in a very similar vein. The text dates from about 1300 and praises Mary as a lovely, radiant, adorable maiden carrying the Son of God in her womb. Britten has set it to music that is basically archaic in mood and melody. The first choir sings the text in English and the second interpolates and comments on it in Latin. The motet "O magnum mysterium" is the work by Morten Lauridsen (born 1943), an American composer of Danish origin. It speaks of the wonder of the birth of Jesus. Here, too, the &"unio mystica" is the theme of this composition, the union with the Divine through redemption and ecstatic contemplation. Jan Sandström (born 1954) dedicates his "Gloria" to "la Casa de la Madre y el Niño" in Bogotá. The idea behind the composition came to Sandström in a dream, which he describes as follows: "In a church on a mountain high above Bogotá, a children's choir sings the Gloria over and over again, during which first one child, then another and another steps forward to interject 'Gloria in excelsis'." Sandström has incorporated this pattern of fast switches from choir to a single chorister into his composition - vibrant rhythm, detailed and delightful harmony combined with a sound that envelopes the listener from all sides, making listening a real experience. The concert "Glass & Stones · Concert for Glass Armonica & Verrophone"
After 150 years of being forgotten, the glass armonica is now being built again, exactly like with the original instrument. It was invented by Benjamin Franklin in 1761. The individual glass bowls (B flat - F) are attached to a rotating axis. For orientation purposes, some of the bowls are marked with gold stripes. These correspond to the black keys on a piano. The performer gently touches the rims of the rotating bowls with a damp finger, causing them to vibrate. The verrophone (verre, French = glass) was invented by Sascha Reckert in 1983 and was based on the principle of musical glasses. Glass tubes are arranged according to size (usually on a chromatic scale) and attached at the vibration points. The length of the tube determines the pitch. Touching a damp finger to the rim makes the glass vibrate. The concert "Awake, my Spirit"
The "Hundert ahnmutig und sonderbar Geistliche Arien" (One hundred charming and especially religious airs), printed in Dresden in 1694, tell of the breath of God as symbolised by the winds Africus and Caurus and of "the silken soft West that leaves its kisses on the roses". This collection is an appendix to the Dresden Gesangbuch and appeared 18 years after the latter; its editor, the composer Christoph Bernhard, did not live to see it in print. The songs were not meant to be sung by the parish congregation - a delicate subject anyway during the tense times of Augustus the Strong's conversion to Catholicism. They were for the private Protestant religious services of the other members of the Royal Family. The melodies are more elaborate than those usual in other ecclesiastical music of the time, the bass parts are highly imaginative and the individual ritornellos are remarkable. There is another collection of 17th century songs that is dedicated to the same theme - Johann Rist's "Himlische Lieder" printed in Lüneburg in 1641/2 and set to music by Johann Schop, the Hamburg City "Rath" (or Council) musician. Both men were friends of Christoph Bernhard, who used his connections as a favourite pupil of Heinrich Schützen to arrange for them to meet the famous Kapellmeister on his journey up to Copenhagen.